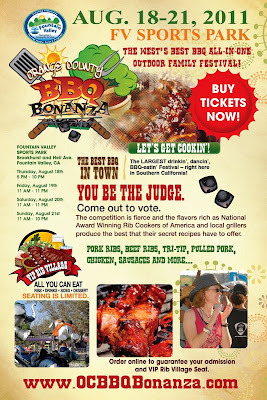 Griffin Eats OC: OC BBQ Bonanza Starts Today! The OC BBQ Bonanza, a 4-day festival, starts today in Fountain Valley. General Admission tickets are $5 each or you can purchase a $100 pass that gets you VIP seating and all-you-can-consume food and alcohol. Kids 12 and under are free, but they are not allowed in the $100 VIP area. Visit our sister site DiningOutInOC.com for more details.